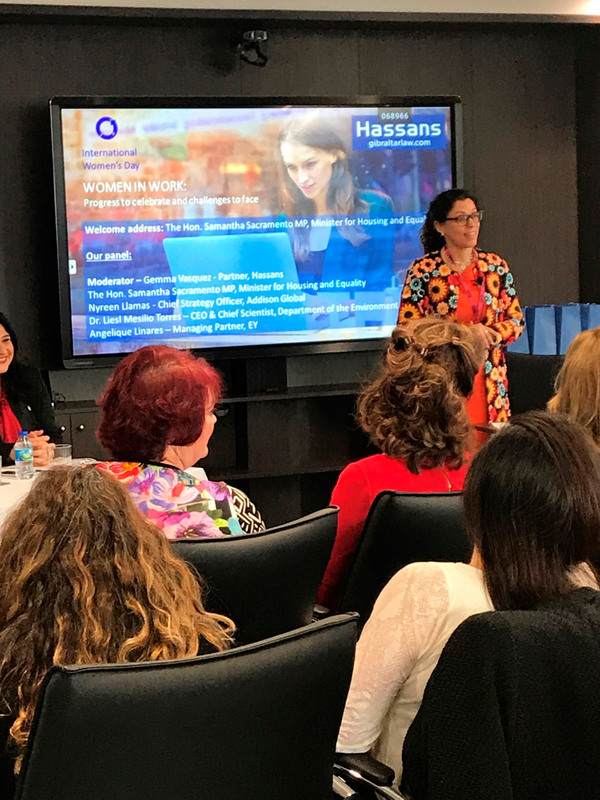 Hassans hosted over 80 local men and women in the business community on the evening of Wednesday 6th March for a panel session discussing Women at Work: Progress to celebrate and challenges to face. “A diverse and inclusive workplace is important. Women are often underrepresented in leadership and management’s positions. This a factor that gives rise to a gender pay gap. Closing the gender gap is a must. The Government is working on various schemes and initiatives to address this, but it is also incumbent on employers and organisations to do their bit. The Minster was joined on the panel by Dr Liesl Mesilio Torres, Chief Scientist and CEO at the Department of Environment, HMGOG, Angelique Linares, Managing Partner at EY Gibraltar, and Nyreen Llamas, Chief Strategy Officer at MoPlay. 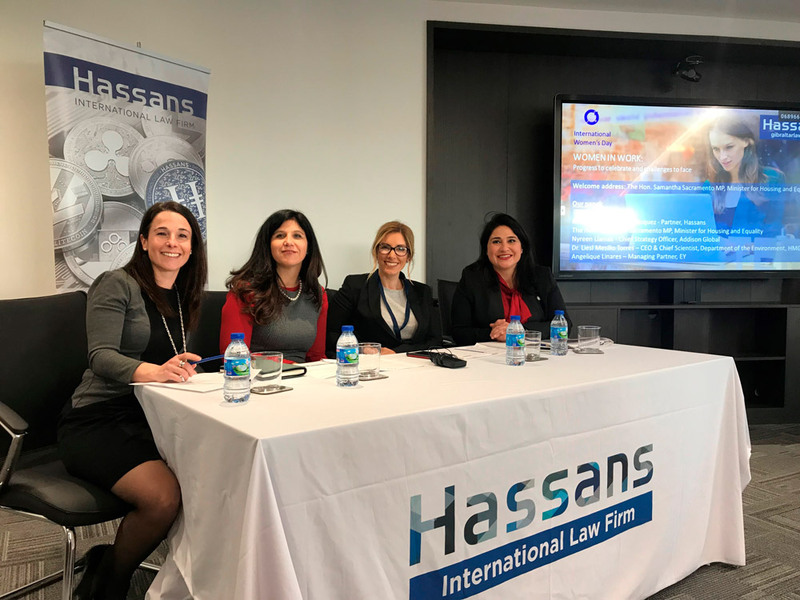 Hassans’ Partner Gemma Vasquez moderated the session, challenging panel members with questions such as “does the glass ceiling exist in 2019?” and “does supporting women in the workplace affect the bottom line?”. The audience was treated to a wealth of statistics from Angelique Linares, which indicated that a higher number of females in leadership roles can dramatically increase a business’ profit margin, productivity and, most notably, when led by a woman, countries achieve an average of 5.4% GDP growth in the subsequent year, compared to 1.1% if led by a man. Liesl Mesilio Torres lauded that “it is possible for professional women to have it all as long as they are supported both in the workplace and at home” and noted that “maternity leave shouldn’t be a black mark in career progression” to which Gemma added that “an organisation spends many years investing in training and development so it makes business-sense to support women returning to work”. Nyreen Llamas suggested that business culture and initiatives can drive change at the same time as government policy. 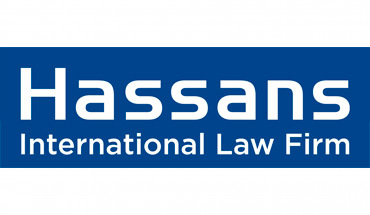 She states: “it is harder for a firm that has been around for many years to change attitudes but far from impossible”, she continued, “women need to be bold to get to whatever success means for them”. She concluded: “newer companies however have no excuse in not ensuring that inclusion, diversity and equality is inherent in their culture from the get-go”. To close, each of the panellists provided top tips for businesses to address gender inequality and top tips for female professionals. At the end of the session, Gemma took questions from the audience which raised interesting discussions on how paternity leave should be structured in Gibraltar, whether it is possible or even desirable for working women to try to please everybody, and what workplaces can do to ensure fairness is achieved for all workers. Guests enjoyed continuing discussions with one another and with the panel members with drinks and canapes well into the evening.